ضرونی زاده, زهرا, متقی, سیدخلیل, رحیمی, حبیب, قدس, عبدالرضا. (1396). برآورد کاهندگی کدای موج برشی در ناحیة شمال‌غرب ایران. مجله ژئوفیزیک ایران, 11(1), 156-170. زهرا ضرونی زاده; سیدخلیل متقی; حبیب رحیمی; عبدالرضا قدس. "برآورد کاهندگی کدای موج برشی در ناحیة شمال‌غرب ایران". مجله ژئوفیزیک ایران, 11, 1, 1396, 156-170. ضرونی زاده, زهرا, متقی, سیدخلیل, رحیمی, حبیب, قدس, عبدالرضا. (1396). 'برآورد کاهندگی کدای موج برشی در ناحیة شمال‌غرب ایران', مجله ژئوفیزیک ایران, 11(1), pp. 156-170. ضرونی زاده, زهرا, متقی, سیدخلیل, رحیمی, حبیب, قدس, عبدالرضا. برآورد کاهندگی کدای موج برشی در ناحیة شمال‌غرب ایران. 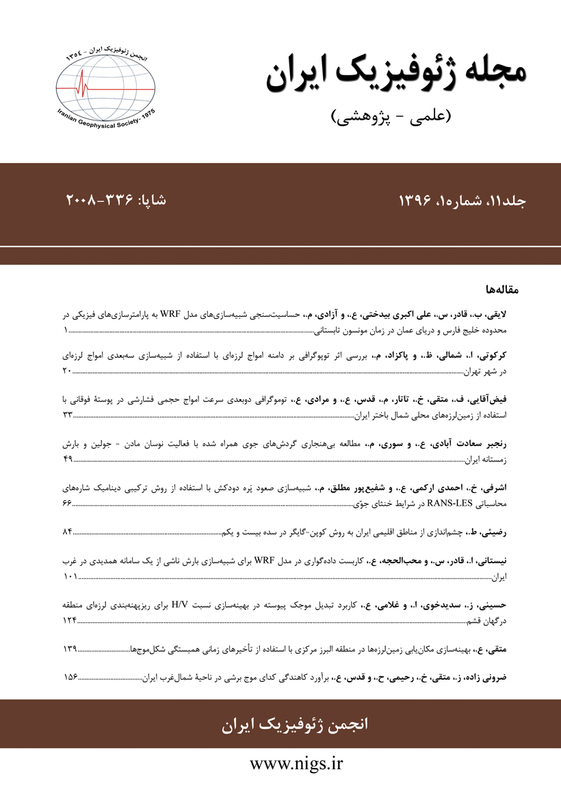 مجله ژئوفیزیک ایران, 1396; 11(1): 156-170. در این مقاله، ضریب کیفیت امواج کدا (Qc) با استفاده از روش تک­پراکنش به عقب برای ناحیةشمال­غرب ایران،محاسبه شده است. برای این منظور، از 3720 شکل­موج باکیفیت، ثبت شده در 8 ایستگاه کوتاه­دوره شبکة تبریز، متعلق به شبکه لرزه­نگاری کشوری مؤسسه­ژئوفیزیک دانشگاه تهران در بازه زمانی سال­های 1996 تا 2013 استفاده شده است. برای تعیین روابط بسامدی ضریب کیفیت، Qc در 9 نوار بسامدی در محدوده 1 تا 24 هرتز محاسبه و تغییرات جانبی و عمقی آنها بررسی گردید. در بررسی تغییرات جانبی ایستگاه­های آذرشهر (AZR) در شمال­غرب آتشفشان سهند، سراب (SRB) در جنوب آتشفشان سبلان و مرند (MRD) کاهندگی بیشتری نسبت به سایر ایستگاه­ها نشان داد؛هرچند که این کاهش قابل توجه نیست. نبود تغییرات جانبی مهم در منطقه سبب شد تا رابطه­ای مشترک برای کل منطقه به صورت 68±1 f 0.84±0.01 ارائه شود.مقدار کم ضریب کیفیت (مقدار68) برای پنجره­های زمانی 30 ثانیه می­تواند شاهدی بر وجود آثار زمین‌گرمایی در منطقه شمال غرب ایران باشد. بررسی تغییرات عمقی Qc نشان می­دهد که با افزایش عمق (افزایش پنجره زمانی کدا)، ضریب کیفیت افزایش می‌یابد. نتایج به دست آمده برای کاهندگی در کل منطقه نشان­داد که n توان پارامتر فرکانس در رابطه بسامدی ضریب کیفیت، با افزایش پنجره زمانی موج کدا رفتاری ناهنجار دارد؛ به­این صورت که در پنجره‌های زمانی بزرگتر از 60 ثانیه به­جای ادامة رفتار کاهشی، افزایش می‌یابد. این رفتار افزایشی می­تواند به وجود ناهمگنی با جذب ذاتی بالا در قسمت بالایی گوشته فوقانی تفسیر شود. As seismic energy propagates through the earth medium, its energy (amplitude) decays due to geometrical spreading, intrinsic attenuation and scattering. Owing to anelastic absorption, intrinsic attenuation converts the seismic energy to heat while scattering redistributes the energy at random heterogeneities. Knowledge of the relative contributions of scattering and intrinsic attenuation is important for appropriate subsurface material identification, tectonic interpretations and quantification of the ground motion. Besides, investigating seismic wave attenuation inside lithosphere allows for a more thorough knowledge as to Earth’s deep structures. The attenuation of short-period S waves, expressed as the inverse of the quality factor (Q−1), helps fathom the physical laws related to the propagation of the elastic energy of an earthquake through the lithosphere. Coda wave attenuation is considered as the combination of scattering and anelastic attenuation. In this study, the quality factor of coda wave was estimated in NW Iran making use of single back scattering method of Aki and Chouet (1975). For this purpose, we analyzed 3720 waveforms recorded by 8 short-period stations of Tabriz network from 1996 to 2013. So as to calculate the frequency relationships for Qc, nine frequency bands with central frequencies of 1.5, 2, 3, 4, 6, 8, 12, 16 and 20 Hz were considered and the lateral and depth variations of Q0 (Qc in 1 Hz) were investigated in the research area. In order to study the lateral variations, we chose coda waves recorded in epicentral distances less than 80 km, in a lapse time window of 30 s. The reason for the selection of such short distance (< 80 km) and narrow lapse time (30 s) was to avoid coda waves reflected from deep scatterers, which ultimately helps compare and contrast the attenuation of shallower structures in the study area. Investigation of lateral attenuation variation demonstrated that in the northwest of Sahand volcano (in station AZR), in the northwest of Sabalan volcano (in station SRB) and around Marand (station MRD), the attenuation underwent a faint increase relative to other areas. Because of the shortage of significant lateral variations in the study area, we presented an average frequency relationship for coda quality factor in a lapse time window of 30 s as Qc = 68±1 f 0.84±0.01. The low amount of the quality factor (= 68) in the mentioned lapse time window reveal the thermal effects of the study area on the estimation of the quality factor. In order to investigate the depth variation of Qc , seventeen lapse time windows from 30 s to 100 s (time interval of 10 s) were extracted for two different datasets, one including an epicentral distance <= 80 km, the other comprised of a distance range of 80-150 km. The Qc factor was calculated for each lapse time in both datasets. The obtained quality factor indicated that Q0 increased with the augment in the lapse time due to the effects of wave propagation inside the deeper parts. Frequency relationship parameter presented unexpected variations; it increased with the increase in the lapse time which is the opposite of typically-observed trends. Anomalous variations in frequency relation parameter versus the lapse time show heterogeneous uppermost mantel beneath the study area. The average frequency parameter obtained in this research was ~ 1.0, a value indicating that the frequency dependency of lithospheric attenuation is negligible in NW Iran. احمدزاده ایراندوست، م.، 1392، بررسی تغییرات جانبی جذب امواج لرزه­ای در منطقه زاگرس: پایان­نامه کارشناسی ارشد، دانشگاه تحصیلات تکمیلی علوم پایه زنجان. راستگو، م.، حمزه­لو، ح.، و رحیمی، ح.،1390. برآورد ضریب کیفیت امواج برشی و کدا در ناحیه هرمزگان جنوب ایران: مجله ژئوفیزیک ایران، 5، 131-111. یعصوبی رستمی، ح.، معهود، م.، انصاری، ا.، 1393، مطالعه پارامتر کاهندگی Qc برای شمال غرب ایران: شانزدهمین کنفرانس ژئوفیزیک ایران، 466-470. Aki, K., 1969, Analysis of the seismic coda of local earthquakes as scattered waves: Journal of Geophysical Research, 74, 615–631. Aki, K., 1980, Attenuation of shear-waves in the lithosphere for frequencies from 0.05 to 25 Hz: Physics of the Earth and Planetary Interiors, 21, 50–60. Aki, K., and Chouet, B., 1975, Origin of coda waves; source, attenuation, and scattering effects: Journal of Geophysical Research, 80, 3322–3342. Akinci, A., Del Pezzo, E., and Iba˜nez, J. M., 1995, Separation of scattering and intrinsic attenuation in Southern Spain and western Anatolia (Turkey): Geophysical Journal International, 121, 337–353. Akinci, A., Taktak, A. G., and Ergintav, S., 1994, Attenuation of coda waves inin Western Anatolia: Physics of the Earth and Planetary Interiors, 87, 55–165. Al-Lazki, A. I., Sandvo, E., Seber, D., Barazangi, M., Turkelli, N., and Mohaman, R., 2004, Pn tomographic imaging of mantle lid velocity and anisotropy at the junction of the Arabian, Eurasian, and African plates: Geophysical Journal International, 158, 1024-1040. Frankel, A., 1991, Mechanisms of seismic attenuation in the crust: scattering and anelasticity in New York State, South Africa, and Southern California: Journal of Geophysical Research, 96, 6269–6289. Havskov, J., Malone, S., McClury, D., and Crosson, R., 1989, Coda-Q for the State of Washington: Bulletin of the Seismological Society of America, 79, 1024–1038. Hessami, H., Jamali, F., and Tabassi, H., 2003, Major Active Fault of Iran: International Institute of Earthquake Engineering and Seismology, Tehran, Iran. Hoshiba, M., 1993, Separation of scattering attenuation and intrinsic absorption in Japan using the Multiple Lapse Time-Window Analysis of full seismogram envelope: Journal of Geophysical Research, 98, 15 809–15 824. Jin, A., and Aki, K., 1988, Spatial and temporal correlation between coda Q and seismicity in China: Bulletin of the Seismological Society of America, 78, 741–769. Jin, A. and Aki, K., 1989, Spatial and Temporal correlation between coda Q−1 and seismicity and its physical mechanism: Journal of Geophysical Research, 94, 14041–3. Kadinsky-Cade, C., Barazangi, M., Oliver, J. and Isacks, B., 1981, Lateral variations of high-frequency seismic wave propagation at regional distances across the Turkish and Iranian plateaus: Journal of Geophysical Research, 86, 9377-9396. Karato, S. L., and Spetzler, H. A., 1990, Defect microdynamics in minerals and solid‐state mechanisms of seismic waveattenuation and velocity dispersion in the mantle: Reviews of Geophysics,28, 399-421. Kumar, N., Parvez, I. A., and Virk, H. S., 2005, Estimation of coda wave attenuation for NW Himalayan region using local earthquakes: Physics of the Earth and Planetary Interiors, 151, 243–258. Maggi, A., and Priestley, K., 2005, Surface Waveform Tomography of the Turkish-Iranian Plateau: Geophysical Journal International, 160, 1068-1080. Ma’hood, M., and Hamzehloo, H., 2009, Estimation of coda wave attenuation in East Central Iran: Journal of Seismology, 13, 125–139, doi:10.1007/s10950-008- 9130-2. Mitchell, B., 1981, Regional variation and frequency dependence of Qβ in the crust of the United States: Bulletin of the Seismological Society of America, 71, 1531–1538. Mukhopadhyay, S., Tyagi, C., and Rai, S. S., 2006, The attenuation mechanism of seismic waves in northwestern Himalayas: Geophysical Journal International, 167, 354–360. Pulli, J. J., 1984, Attenuation of Coda Waves in New England: Bulletin of the Seismological Society of America, 74, 1149–3. Rahimi, H., Hamzehloo, H., and Kamalian, N., 2009, Estimation of Coda and Shear Wave Attenuation in the Volcanic Area in SE Sabalan Mountain, NW Iran: Acta Geophysics, 58, 244–268. Rahimi, H., Motaghi, K., Mukhopadhyay, S., and Hamzehloo, H., 2010, Variation of coda wave attenuation in the Alborz region and central Iran: Geophysical Journal International, 181, 1643–1654. Rautian, T. G., and Khalturin, V. I., 1978, The use of the coda for determination of the earthquake source spectrum: Bulletin of the Seismological Society of America, 68, 923–948. Roecker, S. W., Tucker, B., King, J., and Hatzfeld, D., 1982, Estimation of Q in Central Asia as a function of frequency and depth using the coda of locally recorded earthquakes: Bulletin of the Seismological Society of America, 72, 129–149. Romanowicz, B., 1990, Methodology for the Modeling and Simulation of Microsystems: Boston [u.a.] Kluwer Academic Publishers. Sato, H., and Fehler, M. C., 1998, Seismic Wave Propagation Andscattering in the Heterogenoues Earth: Springer, New York. Shearer, P. M., 1999, Introduction to Seismology: Cambridge University Press, Cambridge, UK, 396 pp. Singh, S. K., and Herrmann, R. B., 1983, Regionalization of crustal coda Q in the continental United States: Journal of Geophysical Research, 88, 527–538. Sipkin, S. A., and Jordan, T. H., 1979, Frequency dependence of Qscs: Bulletin of the Seismological Society of America,69, 1055-1079. Stein, S., and Wysession, M., 2003, An Introduction to seismology, earthquake and earth structure: Blackwell Pub. Xie, J., and Mitchell, A. B., 1990, Back-projection method for imaging large-scale lateral variations of Lg coda Q with application to continental Africa: Geophysical Journal International, 100, 161-181. Tsujiura, M., 1978, Spectral analysis of the coda waves from local earthquakes: Bulletin of the Earthquake Research Institute, 53, 1–48.